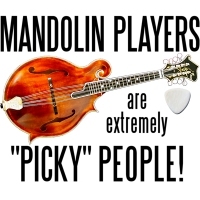 This design features an F5 style mandolin, a pick and the caption reads Mandolin Players are Extremely “Picky” People! Okay, so that’s a very corny slogan, but don’t you know it describes many mandolinists of the “scroll” variety to a T? Find the perfect gift with this design for your favorite picker – maybe that’s you – whether on a tee shirt or other apparel, or a mug or bag, stickers, postcards or whatnot!